Public data on crime rates can help educate citizens and provide insight to governmental agencies and law enforcement. Obviously, the causes of crime are highly complicated, and those areas heavily impacted by crime are often caught up in a vicious cycle of poverty, sub-standard education systems and other difficult problems. But bringing crime rates to the surface can at least foster discussion and help those involved focus their efforts and offer funding to those areas that need it most. 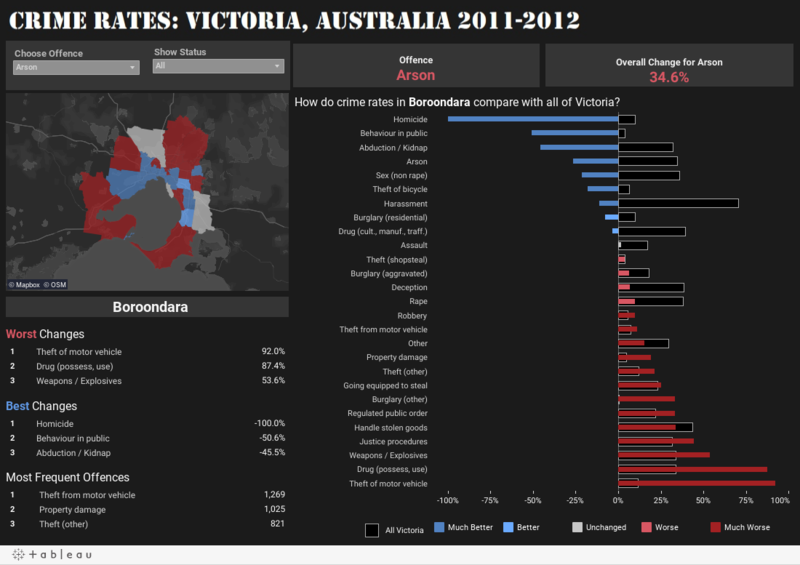 This dashboard of crime rates in Victoria, Australia, clearly identifies these focus areas. From the filters in the top left corner, users can select both an offence and a severity status, which instantly exposes the data for analysis and discovery. The five-stepped color map shows distinct status groups as they compare to Victoria’s average and an overall view of crime rate health. Other visuals are set to always show one of the areas selected in the map. Additionally, the bottom left panel provides worst changes, best changes and most frequent offences for a high-level understanding. The status selection is close in proximity to the color legend to identify the relationship.